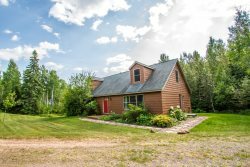 This beautiful and modern vacation townhome in Lutsen is perched on a scenic hillside with panoramic views of Lake Superior near the base of Lutsen Mountains, and only 20 minutes from Grand Marais. In addition, The Heritage Townhomes could not get much closer to the golf course, as you are situated overlooking the River 9 at Superior National at Lutsen, also now home to groomed fat bike trails in the winter. It is a convenient location for skiing at Lutsen Mountains or participating in the Lutsen 99er Bike Race and the Norpine Fat Bike race. Enjoy the Heritage Townhomes while having the panoramic Lake Superior view serve as your centerpiece and the rugged Sawtooth Mountains serving as your backdrop. The largest, most luxurious townhome in the area includes a fully furnished modern kitchen open to the dining area and great room. Stainless appliances, flat panel TV, gas fireplace with a large deck, cantilevered for grilling and enjoying outstanding views, large mudroom & 1/2 bath are also on the main level. Upstairs are 2 bedrooms separated by a living room with a sofa sleeper, gas fireplace, flat screen TV, skylight. The master suite features a pillow-top king bed with private deck and ensuite with 2-person jetted tub. The second bedroom features a pillow-top firm queen bed and separate full bathroom. The lower level studio apartment, called the "Hideaway", is perfect for providing privacy between groups. This cozy & private luxury suite is located on the lower level and features a king bed, refrigerator with ice maker, convection/microwave oven, deluxe tile bathroom, gas fireplace, flat panel TV, and a walk out. This unit is masterfully appointed, including granite and the comforts of in-floor heat (on all levels), and AC (on the main & upper levels). If adventure is what you seek, you've found it! The central location puts you right in the heart of hundreds of miles of hiking and mountain biking trails that weave back into the Superior National Forest. . Plus, you are just 10-20 miles away from many other dining and adventure options in Tofte, Lutsen, and Grand Marais.